Before there were any religious or civil institutions, God created man and woman together, as equals, to reflect the image of God, who is Himself, the Author of life and Creator of all things. After He created them, He blessed them, and commissioned them to “be fruitful and multiply”. The implication is that God desired a blessed posterity to come forth from Adam and Eve’s union, filling the earth with His image bearers. In other words, mankind’s first, and therefore most important commissioning, is father and mother. It wasn’t a religious or political commissioning, it was a family commissioning. For this reason, God alone gets to define fatherhood, motherhood, and family. So it follows that our attitude toward these God ordained roles must completely align with the plumb line of His word, which is His will. With that in mind, and as we celebrate Father’s day in 2015, I want to share with you what I believe are at least four qualities of a faithful father. Now just to be clear, faithfulness is not about perfection (we all make mistakes). It’s about making the effort in good faith. Unfaithfulness on the other hand, means not caring enough to make a serious effort. The writer of the book of Hebrews wrote, “For our earthly fathers disciplined us for a few years, doing the best they knew how. But God’s discipline is always good for us, so that we might share in his holiness” – Hebrews 12:10. This tells us that regardless of how we may view the faithfulness of our earthly fathers or ourselves, we should never project that on to our heavenly Father. He is always good and He is always faithful because He loves us genuinely and perfectly. It also reminds us that faithfulness is borne out of genuine love, and that is what motivates us to do our best to be and become faithful fathers. That said, the first quality of a faithful father is that they love their children enough to discipline and correct them. The writer of Proverbs wrote, “Discipline your children while there is hope. Otherwise you will ruin their lives.” — Proverbs 19:18. Discipline isn’t just about spanking (which should only be done in a non-abusive and age appropriate manner), it’s about correction and requires real involvement in the life of your children. The second quality of a faithful father is that they truly honor their wives. Peter the Apostle, wrote, “…you husbands must give honor to your wives. Treat your wife with understanding as you live together. She may be weaker than you are, but she is your equal partner in God’s gift of new life. Treat her as you should so your prayers will not be hindered.”—1 Peter 3:7. (The word weaker here simply means more sensitive). Honoring our wives this way, as our equal partners, demonstrates to our sons and daughters how a godly man should treat his wife. It also sets the bar of how our daughters should expect to be treated by future suitors and husbands. The third quality of a faithful father is that they intentionally seek to know God and observe His ways. They don’t just seek to know about God, but they seek to know Him through direct personal and continual experience. Jesus said to the people who believed in him, “You are truly my disciples if you remain faithful to my teachings. And you will know the truth, and the truth will set you free.” — John 8:31-32. Jesus is saying that when you remain faithful to His teachings, you will know (have relationship/fellowship with) Him and He will set you free. 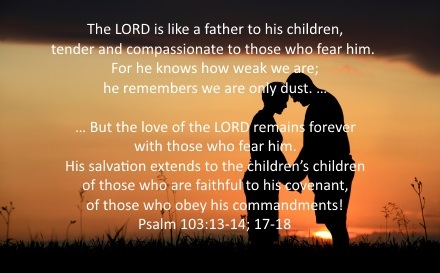 The fourth quality of a faithful father is that they tell the next generation about the glorious deeds of the Lord. Have you shared your testimony with your children? Do they see you walking in vital union with the Lord? Do they see reading and studying the Scriptures, and seeking God for everything? Do they celebrate and praise God with you when He answers?